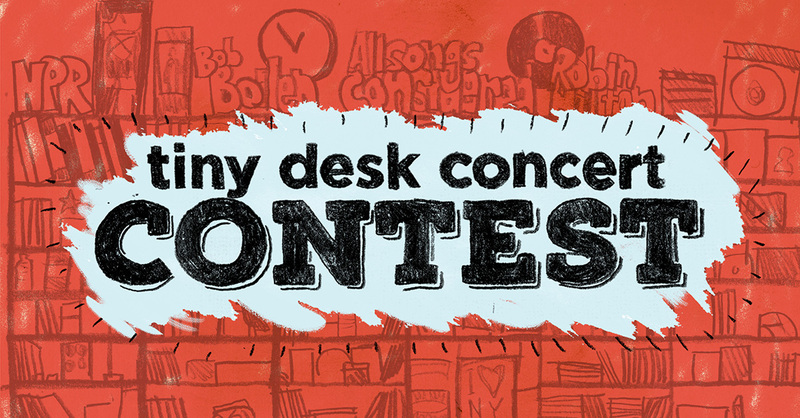 It’s about time for NPR Music to reveal whom they’re flying out to perform behind their famed Tiny Desk, but here are some more of our favorite discoveries of bands that have entered this contest. ATOMGA – “Wacks”: The vintage film, the band crowded into the room, the lounge feel. All of these things and more drew me into this song. A simply groovy bass line that doesn’t really seem to have the tone of a funk band intrigues me. Actually, while this band on paper might some sort of a jazz/funk hybrid, you really just need to listen. They sound like these genres. And they don’t. Also there are djembes. Can’t forget those. Maria Levitov and Counterfeit Madison – “The Wolf and the Crow”: This duo might be two of the best singer songwriters you’ve never heard. Counterfeit Madison’s ability to display passion in several forms compliments Levitov’s quietly confident, unique way of singing in this tune. Simply watching this duo perform will show you their heart. Daniel Dye and the Miller Road Band – “Someday”: Introspective folk coming at you from a family band of sorts from rural Ohio. The town of Mutual to be exact. This band defines being a best kept secret. The song seen here, in spite of its lighthearted introduction, weighs heavy. The chorus hearkens to hope of a better day to come. Prepare to have your heart warmed, and your mind driven to deep thought. Homeless Apians – “Cricket in the Cold”: Playing instruments that appear to be homemade, Homeless Apians look like their having a blast playing this brand of instrumental jazzy math rock. I can’t help but think of the mood conveyed by the room they are playing in. The music seems to glisten and be rough around the edges at the same time. I like this. Alanna Royale – “Cop Show”: Not every band submitted an entry freshly polished and ready for consumption. There’s a certain appeal in that though. Alanna Royale is one of those bands. Rather than seek out the location with the most “indie” NPR-audience appeal, the band filmed the footage for “Cop Show” in their friend’s basement, complete with dogs running around. As has been the case with several of the bands I’ve found while browsing entrants to this contest, Alanna Royale proceeds with ease and confidence. Special shout out to the rhythm section and Alanna herself for emanating a fun vibe. D Mills & The Thrills – “Make It Flow”: I have to admit by this point in my search for talent in this sea of NPR hopefuls I was getting tired of funky bands with a horn section, but DM&TT brought something fresh to my attention. This time we get some hip hop thrown in for good measure, along with some antics on a Korg synth. The only other place I’ve heard this sound is in Columbus’ EOP. Put a hand in the air and start bobbing it up and down now, but only after you’ve pressed play on this video.